Did you ever go to a Thai restaurant and get a dish of that Thai condiment of chili peppers? Sure you have. Most Thai places serve one version or another. When we order in for Thai from one of our local restaurants, we whip up a batch of our own. It's simple and the ingredients can (should) be found in your pantry. 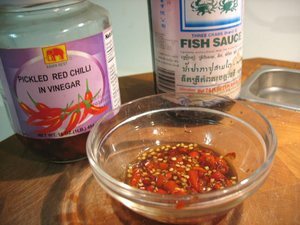 I simply add some chopped pickled Thai chili peppers to fish sauce, maybe some rice vinegar or lime juice, and possibly a touch of sugar. That's all (aside from washing your hands, which will now likely smell like fish and burn whatever it is you decide to touch). This goes well on most Thai dishes (like Thai grilled beef salad) when you're looking for an extra punch of heat. It's sweet, salty, sour, and spicy. These are the elements of so many Thai dishes already (not to mention other southeast Asian cuisines), so it's a perfect marriage. Those pickled chili peppers come in handy when you're making larb as well. You can get them at most Asian markets, online, and at Han Ah Reum (Hmart) around the country.